The United States of the 1930s, as World War II loomed ahead, was a prolific era for radical movements. The third Madison Square Garden was packed to the gills for an anti-Nazi rally in 1937 and a pro-Nazi rally in 1939. But the latter was really the pinnacle of a more entrenched pro-Hitler community in the United States. One planned community in Yaphank, Long Island replete with an indoctrination camp amidst streets named after Hitler, Goering, and Goebbels, serves as a prime example of how the German-American Bund and German Settlement League managed to put forth a message in which American democracy and fascism could co-exist, something that Ryan Schaffer of the Department of History at Stony Brook University explores in an article for the Long Island History Journal. A special Long Island Railroad train, the “Camp Siegfried Special” even ran at 8am from Penn Station to Yaphank to bring guests to the site. Here is a notorious house in Glendale’s history. Its address is 823 E. Colorado Street. 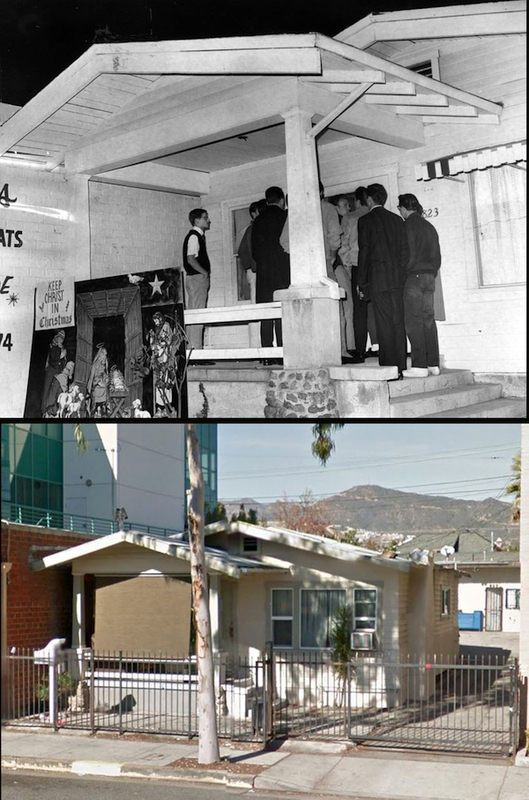 In 1964-65, it briefly became the American Nazi Party’s western headquarters after American Nazi Party leader George Lincoln Rockwell made the announcement that its new Glendale branch was now a “center of resistance to communism, Zionism and race mixing.” The person who leased the house was Ralph Forbes, a “self-described” Nazi party captain, who proudly hung a portrait of Adolph Hitler over the fireplace, sold Nazi literature from his home, conducted meetings, and had an armed, brown-shirted storm trooper standing guard outside. Embarrassed by the negative attention, the City of Glendale swung into action, refusing to turn on the electricity unless Forbes signed an affidavit swearing not use the house for Nazi gatherings. Forbes refused and meetings were held by candlelight. At that time, Glendale’s local Nazi membership was estimated to be around 25 people with over a 100 more members occasionally driving in from the coastal towns near (and including) Long Beach. These eerie photos show what remains of an American internment camp used to detain suspected Nazis from South America during the Second World War, which ironically ended up imprisoning more Jews than fascists. 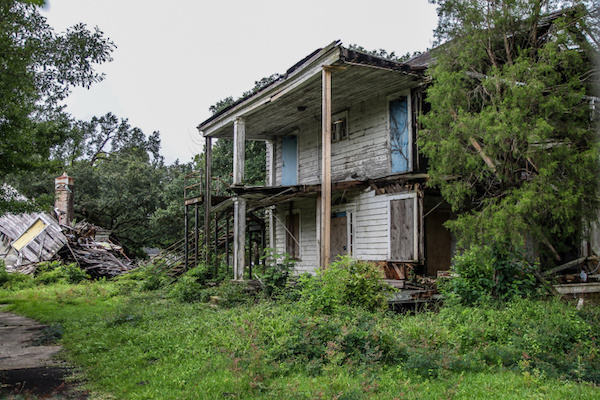 Images from the site in New Orleans, Louisiana show decaying buildings in a state of disrepair, with some reduced to rubble having been left to fall apart - where Jewish refugees were forced to live side-by-side with their Nazi oppressors. The camp, originally named Camp Algiers, was established in 1941 by the American government as a place to detain suspected Nazis from South America. But photographer Abandoned Southeast, who took the photos, says that few of those who ended up in the camps actually had ties to the Nazis and it became instead known locally as, 'the camp of innocents'. 'Camp Algiers was a former embarkation facility along the Mississippi River that was used as a Nazi internment camp during World War II,' he says. 'The internees included men, women, and children who had been detained by FBI agents in Latin America and brought back to the United States. 'But most of the internees were actually Jewish refugees who had fled Europe from the Nazis. Roughly, only 15 per cent of the 5,000 internees had at one point been members of the Nazi party.' After the Japanese attack on Pearl Harbor and the subsequent declarations of war on America from both Germany and Italy, President Roosevelt wanted to ensure that the Axis powers could not open a third front in South America. Some went to work as hospital orderlies. Others picked cotton, baled hay, or tilled soil, living in accommodations near farmland. They ate dinner with families and caught the eyes of single women, running off with them whenever and however they could. The only thing separating the visitors from the locals of Hearne, Texas was the “PW” insignia stitched into their clothing—that, and the fact many couldn't speak English. 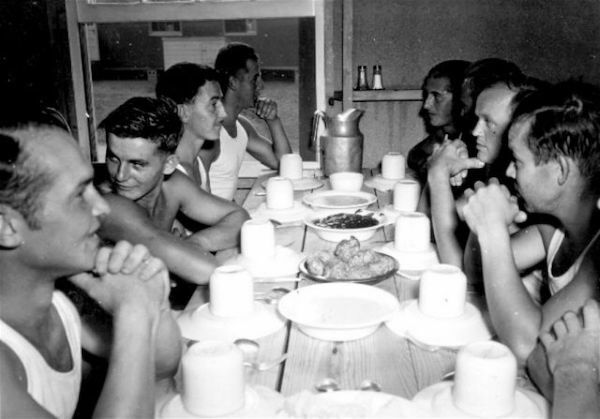 The men were Germans who had been captured by Allied forces, and from 1943 through 1945, more than 400,000 of them were sent to the United States for detention in barracks. Between 500 and 600 centers were set up across the country, but many of the prisoners wound up in Texas because of the available space and warm climate. Almost overnight, the people of Huntsville, Hearne, Mexia, and other towns experienced a kind of cruel magic trick. Their loved ones had disappeared, sent overseas to contest World War II; captured Germans materialized in their place, taking on the role of laborer. Those that refused work peered from behind 10-foot tall fencing capped with barbed wire as teenagers drove by to stare at the faces of the enemy. Whatever their imaginations had conjured up, it didn’t match the reality: The men behind the fence looked less evil than bored. And by the time the U.S. government was done with them, many would reconsider what they were fighting for. 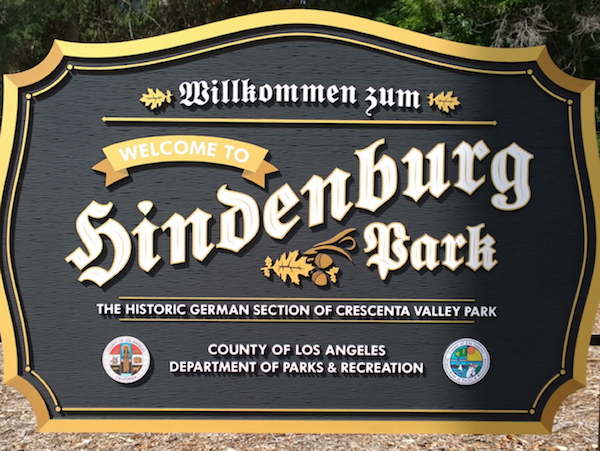 It may read "Willkommen zum Hindenburg Park," but county officials are finding out the hard way that the new sign at the entrance to Crescenta Valley Park isn't so welcome, especially at a park where Nazi rallies were held in the 1930s. The new sign, which references Paul von Hindenburg—a former German president who some argue helped Hitler rise to power— was debated at a heated public hearing last Thursday, according to the L.A. Times. A trio of representatives from L.A. County's Human Relations Commission heard from supporters and opponents of the sign at the packed community meeting. The western section of Crescenta Valley Park was historically known as Hindenburg Park, but the name was dropped in the 1950s when the county acquired the land. According to the Crescenta Valley Historical Society, the portion of Crescenta Valley Park west of Dunsmore Avenue was owned for decades by the German-American League, who acquired the land in 1925 and named it for World War I hero and former German President Paul von Hindenburg (Hindenburg was president of the Weimar Republic during Hitler's rise to power). Los Angeles County acquired Hindenburg Park for $91,000 sometime in the late 1950s (accounts differ on the specific year), and folded it into the already-established Crescenta Valley Park, according to the L.A. Times. The western section of the park has technically been known as Hindenburg Park since the 1990s, but the sign at the entrance went up in February 2016. The Times reports that the new sign, which delivers its message in German and English, was fully paid for by a German heritage organization called the Tricentennial Foundation, but its installation was approved by the Los Angeles County Department of Parks and Recreation. Today it’s hard to imagine that the following sentence could be describing an actual rally that once took place in a rural Sussex County town of Andover, NJ: “Flames from the wooden cross, forty feet high, crackled into the night throwing lurid shadows on the participants below, some of whom were dressed in hooded white robes, others in the gray uniforms of the German-American Bund. 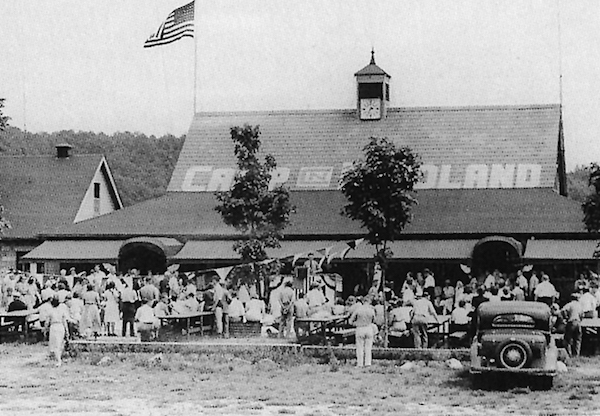 The scene took place at Bund Camp Nordland in New Jersey on August 18, 1940, when the Klan staged a monster anti-war, pro-American mass meeting jointly with the Bund.” The passage was written by local north Jersey author and historian Frank Dale, and is an accurate recounting of what took place at the German-American Bund Camp Nordland in the days leading up to the U.S. entering World War II. During the years prior to WWII, America was in the grips of the worst economic depression that the nation had ever experienced. Unemployment was at a record high, and soup lines were a common sight in major cities across the country. Clashes between plant owners and labor unions often turned into bloody melees. At the same time it was becoming more evident that our nation’s participation in the conflict overseas was imminent. Unrest and frustration amongst the working classes opened the door of opportunity to a number of fringe political ideologies that might never have seemed like viable alternatives before. There was a resurgence in the Communist Party in the U.S., and even the Ku Klux Klan was enjoying an era of record recruitment. Overseas in Germany, Adolph Hitler had taken a bankrupt post World War I nation in chaos and revitalized the economy and self-image of the populous (albeit at the expense of certain ethnic groups which were blamed for all of the country’s ills). It was a time of great uncertainty, high tensions, and mistrust. Here at home that mistrust was aimed squarely at German-Americans. In the 1930s, there were 112,000 German-born immigrants living in New Jersey. They were second in number only to Italian-Americans as the largest foreign-born ethnic population. Almost one quarter of the citizens of the United States at the time were of German descent. So how did these new New Jerseyans deal with the political climate here, and the influence of the Nazi Party, which was becoming all powerful back in their homeland? Generally there were three different viewpoints that most German-Americans ascribed to: Many embraced their Americanism and rejected Germany altogether; A large portion recognized Germany as their homeland, the place where their parents came from and where their cousins still lived, but did not condone the actions of the new government there; Then there was a third group––the group that proudly embraced Nazi ideals and pledged their allegiance to them. This faction would come to be known as the Bund (which means federation). 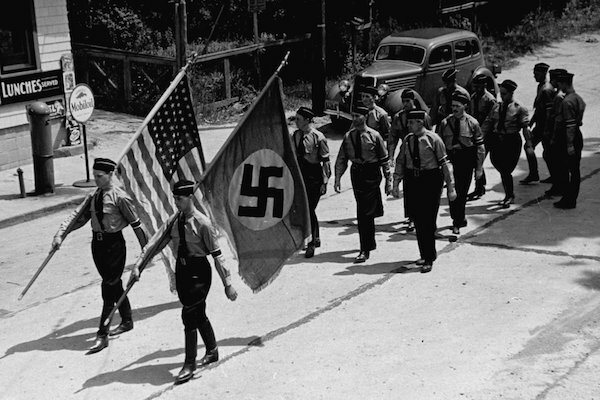 It was the American equivalent of the Nazi party, and boasted over 10,000 members––and its history is intricately tied to New Jersey. Camp 30, a former Nazi POW Camp, sits on the outskirts of the small town of Bowmanville, Ontario. It was the first of its kind and was the only one used by Allies to house high-ranking Nazi officers captured during World War II. The Allies felt that Bowmanville was the perfect location to house the dangerous high ranking Nazis—it was far enough away from Europe and in a rural location away from Canada's main cities. Placing POWs here rendered them worthless to the war effort, which was seen as a great victory. In 1942, the prison camp was the site of the "Battle of Bowmanville," in which prisoners rioted with baseball bats and hockey sticks in protest of a plan to shackle them as a reprisal for the chaining of Canadian soldiers captured by the Germans at Dieppe. The battle lasted three days, during which a Canadian guard had his skull fractured, and 400 prisoners barricaded themselves in a hall. A group of students at a nearby commando course in Kingston, Ontario arrived on Canadian Thanksgiving and subduing the barricaded prisoners with fire hoses and tear gas. 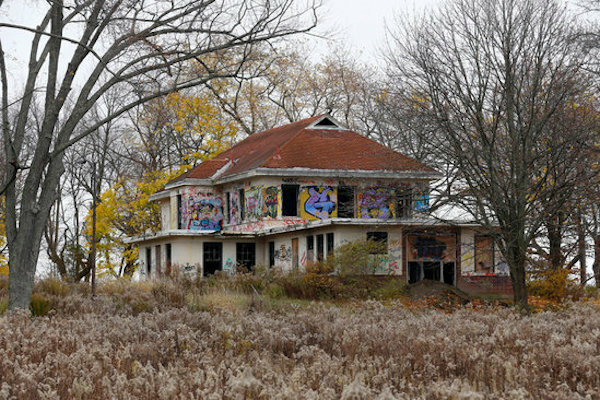 Camp 30 was declared a Canadian National Historic Site in 2013, and the Municipality of Clarington, where it's located, is looking at ways to restore it. Tucked into the Santa Monica Mountains overlooking the Pacific, just past the McMansions of the Pacific Palisades, lie the decaying, graffiti-plastered remains of what is believed to have been a 1930s compound for Nazis in Los Angeles. A few years ago, I first hiked out to Murphy Ranch, the abandoned compound, after hearing about it (ironically) from an Israeli friend who was obsessed with L.A.’s weird side. After returning a couple of times, I went again this summer because the city of Los Angeles, which owns the land, announced this past spring it was tearing down some of the structures. After parking the car alongside the neatly manicured lawns off Capri Drive in the Palisades and beginning the walk along the road that hugs the dusty mountainside, past the mega-mansions being built into the hillside and a semi-buried pickup truck, I eventually came to what used to be the entrance to the ruins. A few years ago an ominous set of black gates with crumbling flagstone walls—now torn down—marked the entrance to the site. Now a person just has to hope they go the right way, following the path until they find the first of the ruins’ famed sights—the 500-odd concrete steps leading down a terraced landscape to the compound. In 1933, the property that now makes up the ranch was bought by one Jessie M. Murphy. This name is believed to be a front, historian and head of the Palisades Historical Society Thomas R. Young told the Los Angeles Times. (Young did not respond to Daily Beast requests for an interview.) The property was really bought, he says, by the heiress Winona Stephens and her husband, Norman, while under the influence of a German who claimed to have supernatural abilities—Herr Schmidt. Under his influence, Young told the Times, the Stephenses sunk roughly $4 million into the property. Herr Schmidt had convinced them that Adolf Hitler was going to take over the world and that the U.S. was going to collapse, so Nazi sympathizers needed a stronghold for when it was time to emerge and take control. 0 Response to "8 Shocking Nazi Locations In North America"